Cello and Hooch are coo-coo for coconut, so I decided to try a new recipe that includes both coconut oil and coconut flour. These treats are organic and grain-free. ½ cup broth (I make my own from boiling Bison meat from Whole Foods). If you do not make your own, be sure that the broth has no traces of onion or onion powder in it. Preheat oven to 400 degrees F. Use parchment paper to line a baking sheet. In a small saucepan over medium heat, bring the broth and coconut oil to a boil. Remove from the heat and whisk in the pumpkin. 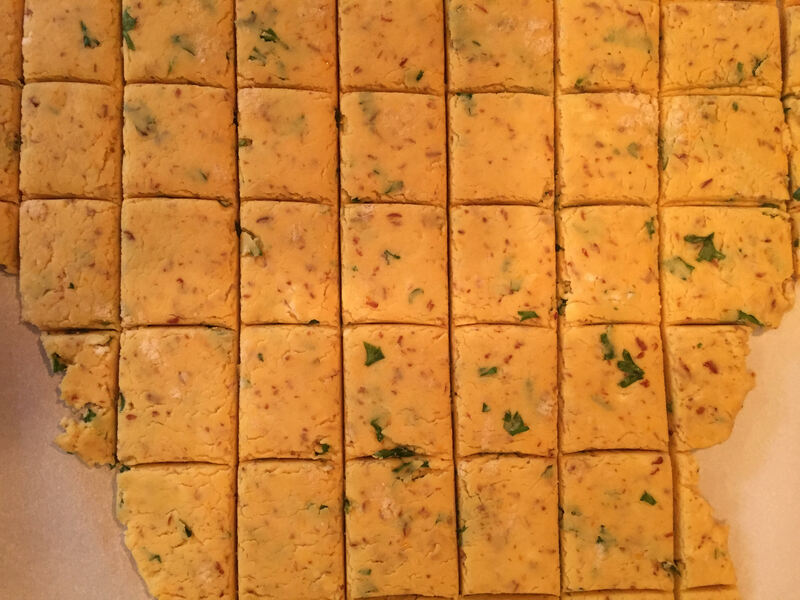 In a large bowl, stir together the tapioca flour, coconut flour, sea salt, yeast, flaxseed and parsley. Pour the broth mixture into the dry ingredients and stir until no traces of dry ingredients remain (the dough will become stiff). Roll the dough out on a lightly floured piece of parchment paper, to about ¼-inch thickness, and cut into desired shapes. I cut mine into 1-2 inch squares. 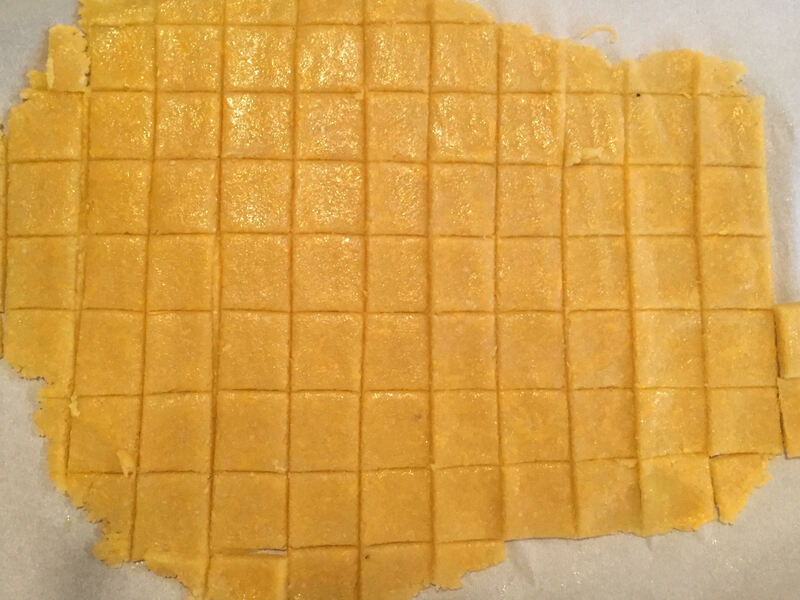 Transfer parchment paper with cut treats to the prepared baking sheet, and bake for 15 minutes. 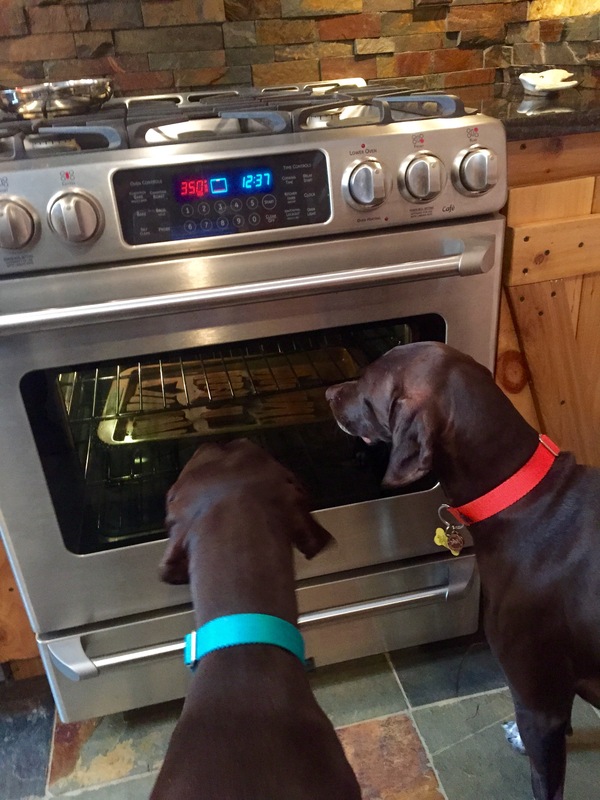 When the timer goes off, leave the treats in the oven and crack the oven door until they are cooled completely (this will help them dry out a bit, and make them crunchy). 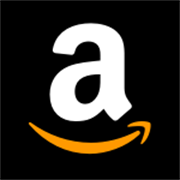 Store in an airtight container at room temperature for up to 1 month, or in the freezer to keep longer. 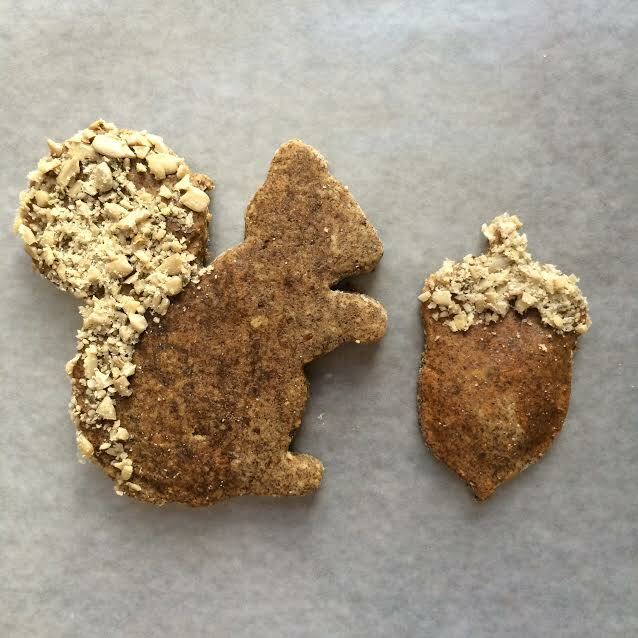 This cute squirrel treat recipe was taken from Dog Treat Kitchen – I modified it a bit from the original recipe. I loved the look of the cookie, but wanted to make the treat grain free, and as organic as possible. In a large bowl, whisk together the buckwheat flour, almond flour, flax and cinnamon. In a small bowl, thoroughly mash the banana, then stir in the beef broth and oil until combined. Pour the banana mixture into the flour mixture. Stir together until you reach a coarse crumby texture. Knead the dough with your hand, in the bowl, until it forms a dough ball. Line your baking sheet with parchment paper, or dust it with buckwheat flour so the dough will not stick. Roll dough to 1/2 inch thickness, between two sheets of parchment paper (or dust top of dough with flour). Transfer cut outs to baking sheet. 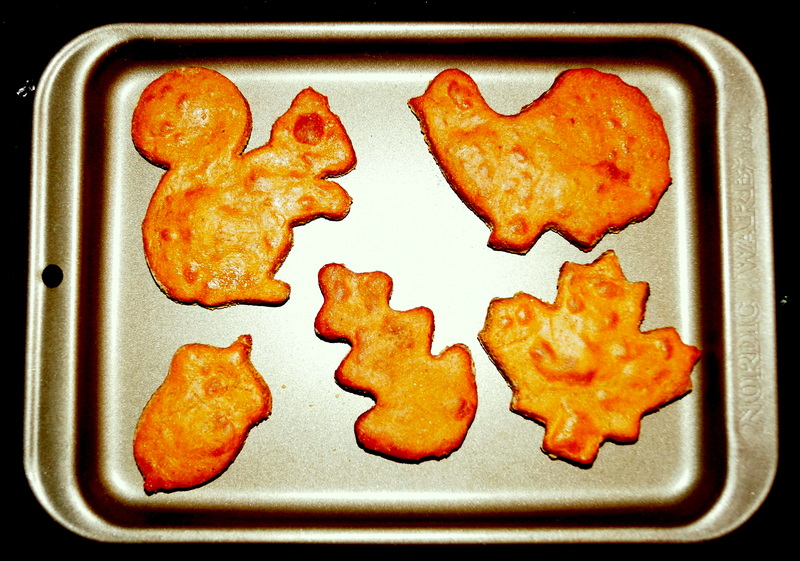 Turn off the oven, and leave the treats inside while the oven cools. Once completely cooled, apply the glaze and sunflower seed topping. In a microwave safe bowl, combine the water and honey. Microwave on high for 5 to 10 seconds. Stir together until the honey is completely dissolved. Using a pastry brush, brush the honey glaze on the tail of the squirrel. Press the tail into the finely chopped nuts. Set aside, and let the glaze dry before serving to your dog. These treats will stay fresh in the fridge for up to one month, or in the freezer for up to 6 months. Yield – Depending on the cookie cutter(s) you use, you’ll be able to get about 9, 1/2 inch thick squirrels. Using the squirrel cookie cutter I had, I got 9 squirrels, and used an acorn cookie cutter for the smaller, left over dough pieces. The yield will vary, depending on the size of dog treat cookie cutter(s) you use and how thick you roll the dough. Rolling dog treat dough is so easy with parchment paper. If you don’t have it, you can to dust your work surface and rolling pin with buckwheat flour to keep it from sticking. You can line your baking sheets with parchment paper – or spray your baking sheet with non-stick spray before placing the cut outs onto it. For some dough mixtures such as this one that may be a bit stickier, try filling a shallow dish or bowl with flour and dip the cutter into it before each cut. Then very gently wiggle the cutter back and forth to separate it from the rest of the dough. I hope your pooch enjoys this treat as much as Cello has! 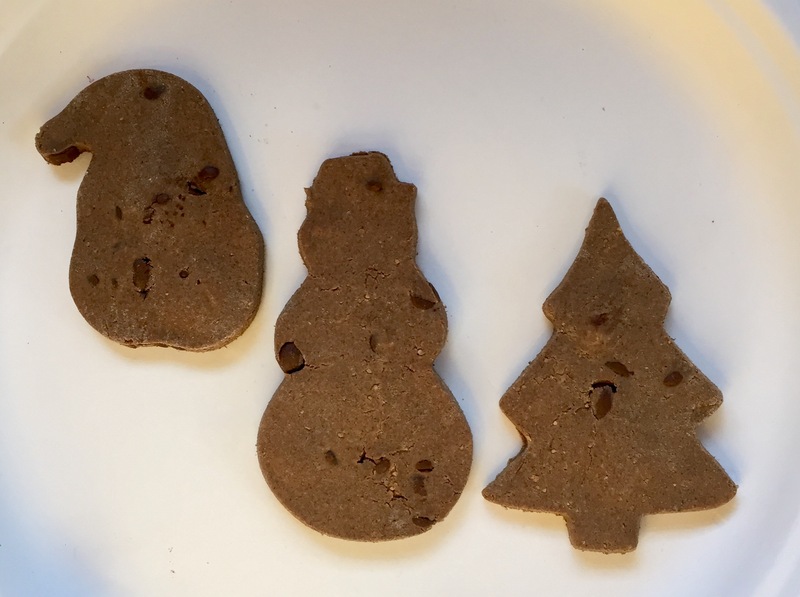 A week or so ago, I saw this yummy recipe on Dog Treat Kitchen. Tonight I decided to bake these treats for Cello. Cello is currently on a grain-free diet, so I knew I had to alter the ingredients a bit. I decided I would exclude the rolled oats in the original recipe, and substitute Buckwheat flour for the whole wheat flour also listed in the original recipe. At the same time I was preparing to bake some treats, I also decided to boil my usual batch of hard-boiled eggs for my breakfast, and for Cello’s weekly dinner additive. Perhaps doing two things at once was not such a good idea! The recipe called for 2 eggs – and now I was all out. I Google searched what I could substitute for eggs, and was pleasantly surprised to find that 1/4 cup of applesauce could be substituted for each egg in most backing recipes. As luck would have it, I had some organic, unsweetened applesauce in the fridge (PHEW!! 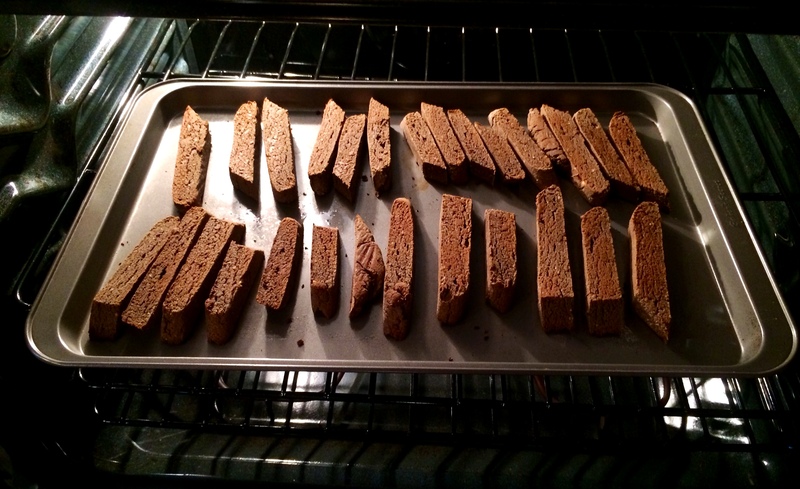 )… turns out, my mistake blossomed into a blessing…the biscotti turned out great!! They were nice-and-sweet with the added apple sauce! Place the peeled bananas and peanut butter into a large microwave safe bowl. Microwave the bananas and peanut butter for 30-60 seconds, to soften. Thoroughly mash the bananas while mixing in the peanut butter. Make a well in the center of the flour and pour in the banana mixture. Using a fork, stir together the wet and dry ingredients until completely combined. If needed, use your hands to mix together the mixture. Lightly spray a baking sheet with non-stick cooking spray. Turn out your dough ball onto the prepared baking sheet. Gently press the ball into a rectangular loaf shape about 1 inch thick. Try to make your shape as uniform as possible for even baking. Let the banana biscotti loaf cool on a wire rack for 5 minutes. Cut the loaf in half, lengthwise. Cut strips about 1 inch thick. Place the slices, cut side down, and bake for another 20 minutes. 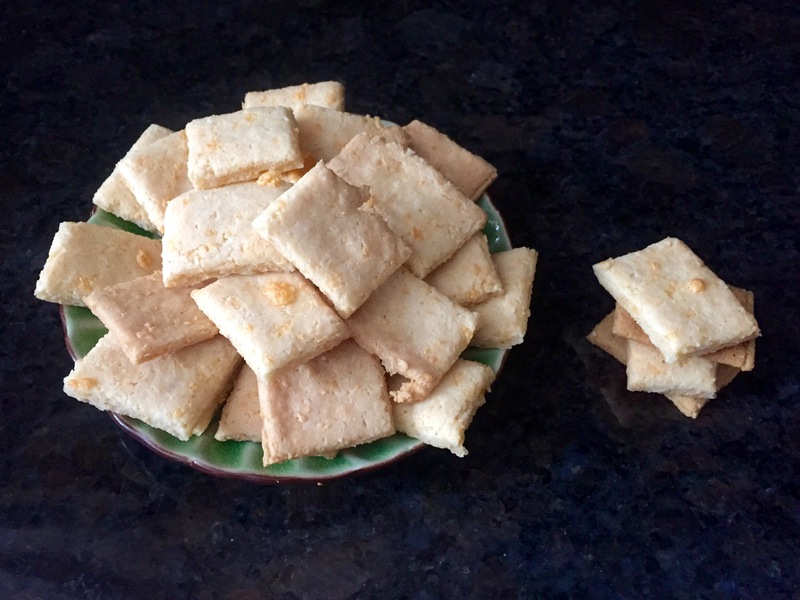 Turn biscotti pieces over (flip), and bake another 20 minutes. 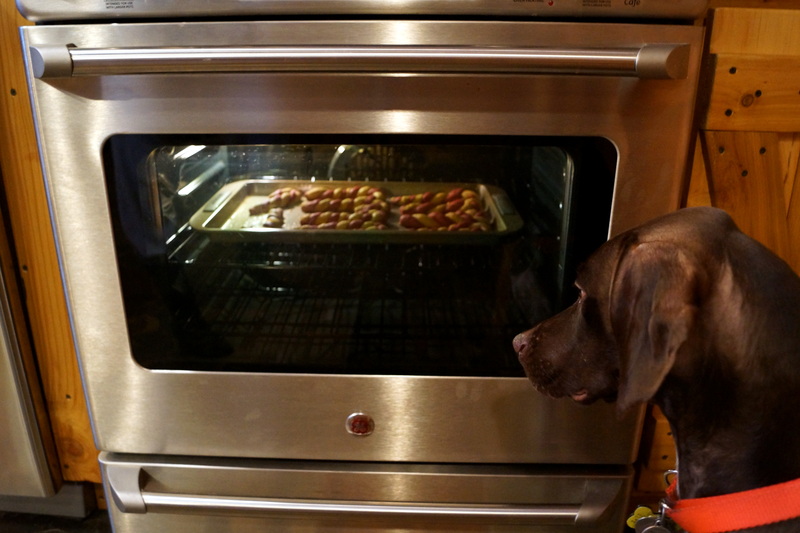 Turn the oven off, and let the treats cool completely in the oven. Cello and Hooch approve…hope your pooch does too! “Bone” Appetit ! Grain Free, Sugar Free Canine Candy Canes! Whisk together the flour, powdered milk and baking powder. Pour beef stock in small bowl, and whisk the eggs into stock. Form a well in the dry ingredients, pour in the wet ingredients. Knead the dough for about two minutes. Add more flour until the dough is no longer sticky (dough will be VERY sticky and hard to work with. Keep adding flour until dough is reasonable to work with. Form a well in one of the halves of dough. Add the food coloring and peppermint flavoring to the one half of dough. Wearing food safe gloves, knead the coloring and flavoring throughout the dough. Cool the dough in the freezer for 30 minutes. Scoop a tablespoon of each half of dough into tablespoon-sized balls. Gently roll each ball into a “worm” shape, letting the dough rest when needed. Each strip should be about 5 inches long. Twist one plain strip with a red strip, and curl the end to shape a candy cane. Place on the baking sheet. Whisk the extra egg (whites only) in a small bowl. Using a pastry brush, thoroughly coat each candy cane with the egg wash.
Garbanzo bean flour: Although a great alternative to grain-based flour, this flour is SUPER sticky and can be difficult to work with. Keep adding flour until dough is at a consistency you are comfortable working with. Allowing the dough to cool in freezer will help with handling this sticky dough. Food Coloring: rather than use artificial coloring, I chose an all-natural vegetable base coloring made from beet juice (India Tree brand vegetable colorants). Beet powder is also another great alternative to artificial coloring. Yield: will depend on how long/thick you make each “worm” when you are twisting the candy canes. My batch made 15 candy canes. 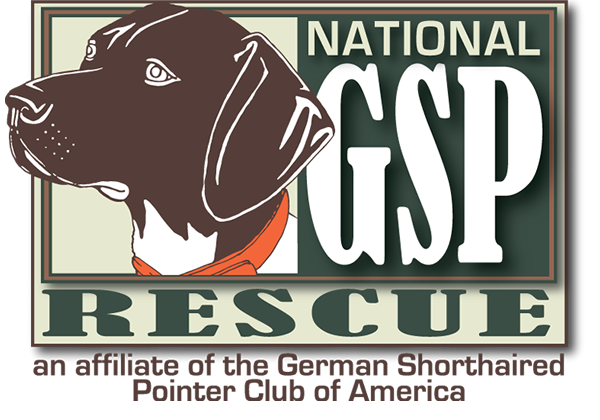 Storing: Remember, these treats do not have any preservatives, so they will need to be refrigerated, or frozen for use at a later time. 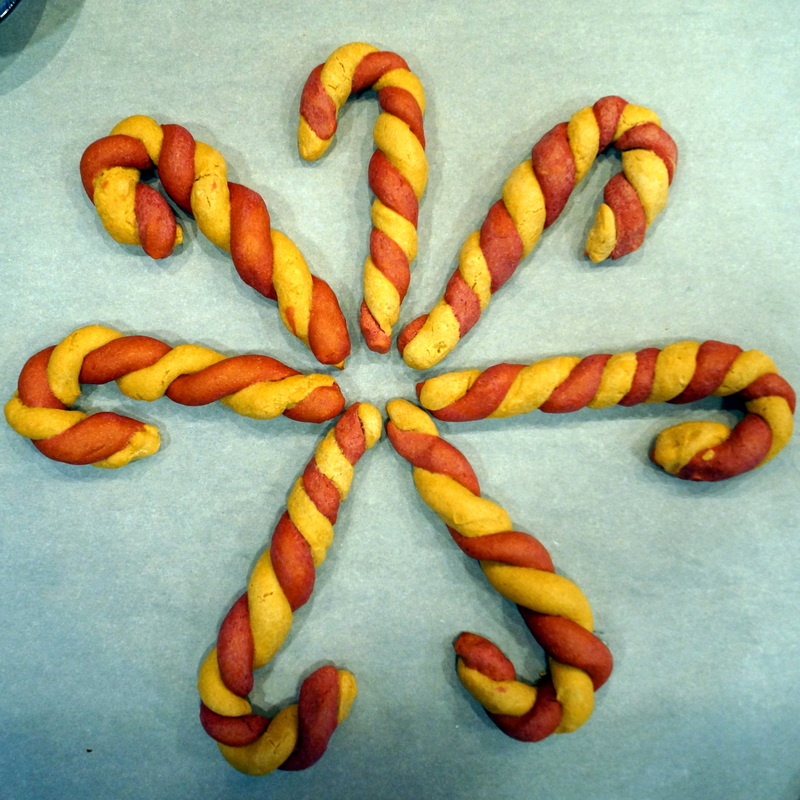 These canine candy canes will keep fresh for approximately two weeks in the refrigerator, or for about 6 months in the freezer. Cello has had recurring ear infections lately. It was suggested to us to try her on a grain-free diet for 30 days to see if her ear problem ceases. Her dog food is of very high quality, and is already grain free. 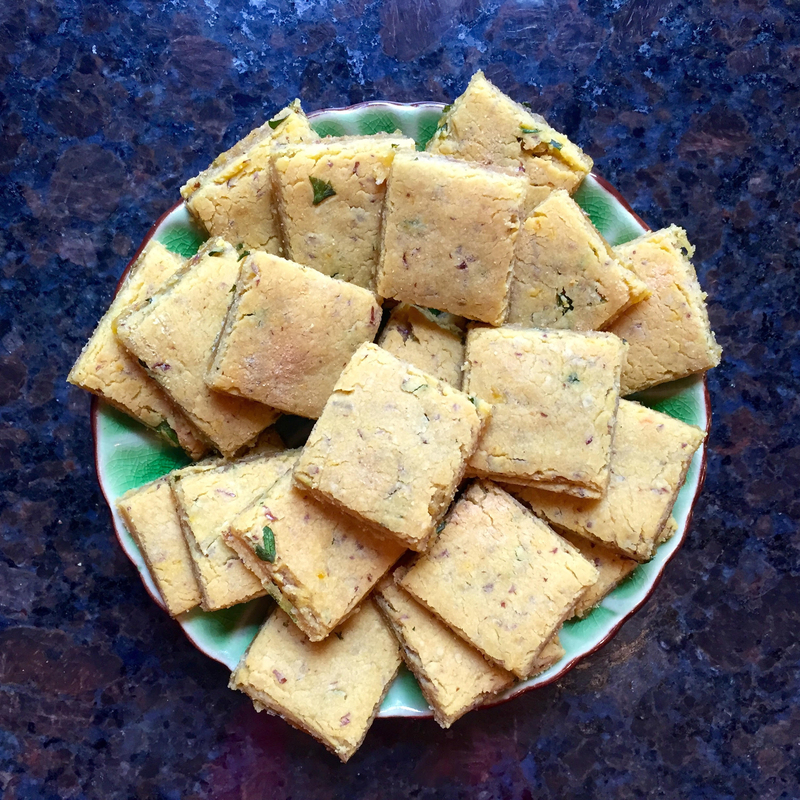 However, all of the treats I was making her had whole-wheat flour as an ingredient …so – this is the first grain-free treat to be made in Cello’s Cucina! 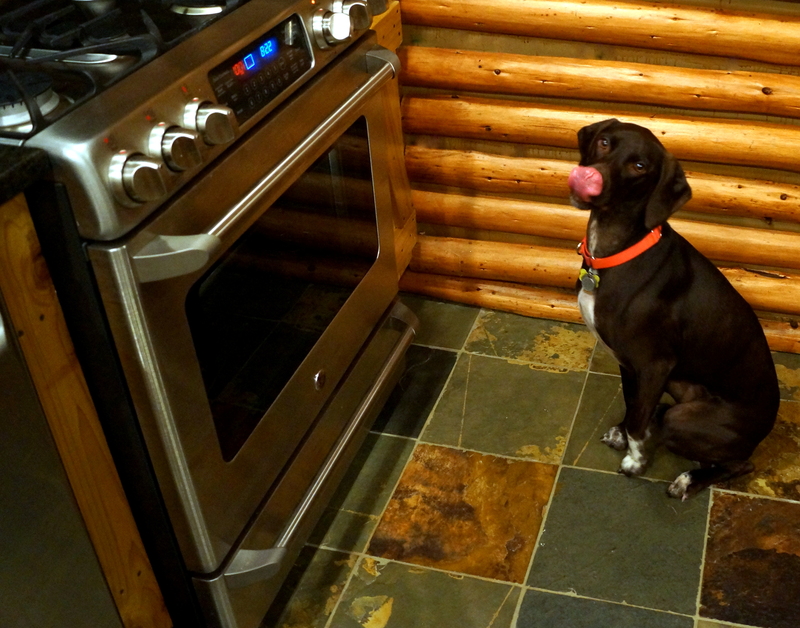 Cello is licking her lips waiting for her treats to be done! 3. The dough will be very sticky – so generously flour everything – including your hands. Roll the dough out to about 1/4-inch thickness. 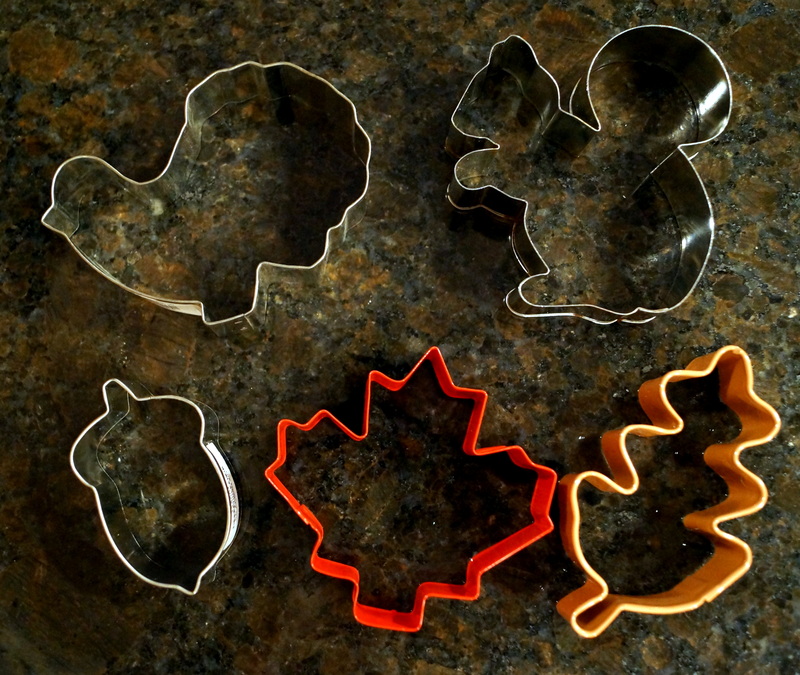 Use cookie cutters of your choice to cut out the cookies. come out a pretty pumpkiny-brown! Let cool on a wire rack for soft treats, or turn oven off and let treats sit in oven for 1-2 hours or more if you want crunchier treats. I baked mine at night, so I just shut the oven off and left treats to cool overnight. In the morning I put some in the refrigerator, and some in the freezer to take on our camping trip. Cookies can be stored in an air tight container in refrigerator for approximately 2 weeks – or in the freezer if you would like them to last a bit longer, or if you wanted to save them for a later date.